Joseph Phipps was a tallow chandler. In other words, he made or sold tallow candles. He was born on the 18th or 28th (sources differ) of August of 1640 in Reading, Berkshire, England. Genealogists differ as to whether his father was Thomas Phipps or John Phipps. Various Internet genealogists claim John Phipps as his father, but the book Lawmaking and Legislators in Pennsylvania: A Biographical Dictionary, Vol. 1, 1682-1709 has been cited as saying that his father was Thomas Phipps. At some point, this Joseph Phipps became a Quaker. “Friends,” or adherents of the Quaker faith, were heavily persecuted at the time in England. When, in keeping with his Quaker beliefs, Joseph refused to take the oath of allegiance in January of 1661, he was thrown in jail. He should not be confused with a later British Quaker, also named Joseph Phipps, who lived from 1708 to 1787. That later Joseph is well remembered as the author of various books, the best known being The Original and Present State of Man. The earlier (born 1640) Joseph Phipps was imprisoned various times for his faith as a Quaker. Between June 1662 and July 1666 he was jailed at least six times for participating in what were deemed illegal religious assemblies. On the 16th of January 1666, Joseph Phipps was tried at the Sessions in Reading for his third offense. The court was to consider whether he should be banished to one of the colonies. Just before the trial, another Quaker was acquitted. As a result, the court discharged the jury and assembled another. After the second jury was empaneled, Joseph Phipps was brought into the courtroom and his indictment was read. He had already entered a plea of not guilty. One thing that Joseph Phipps said in his own defense was that there were fewer than five persons who were 16 years of age at the meeting in which he was charged with participating. The judge then declared that he would send Joseph to prison even if there was only one person of that age, as long as at least five people were present. When the jury had deliberated for quite a while, a court official sent for them. The jury was then threatened that they should not acquit the Quakers, but still the jury could not agree. The court then said that the jury should be kept all night without light or heat and without visitors until they would come to an agreement. When the court met the next morning, the jury members declared that they had still not come to an agreement. Finally, however, two of those who could not go along with the banishment finally agreed to it, and the announcement was made that there was a verdict. In sentencing Joseph Phipps, the judge said that he would be transported to one of the colonies for seven years. He was then, however, returned to prison, where he remained until he was released six years later, in 1672, by letters patent of the king. His wife, Sarah (Binfield) Phipps, was released in 1672. She had been in jail since 1671. After being released, however, Joseph Phipps was again jailed for refusing to swear allegiance. This time he was jailed from October 1675 to February 1676. In 1682, Joseph Phipps and his wife Sarah emigrated from England to America. Various genealogists say that they came with William Penn to establish the colony of Pennsylvania, but whether they actually traveled with Penn onboard Penn’s ship the Welcome is not clear. Such sources as Welcome Claimants do not list Joseph Phipps as having made that particular voyage, but that does not mean that he did not. 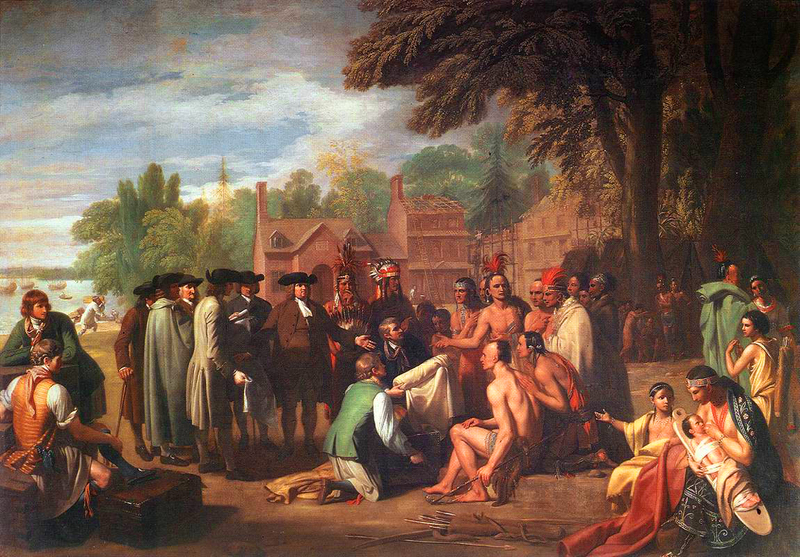 Joseph Phipps appears standing at William Penn’s extended right hand in a painting by Benjamin West depicting Penn making a treaty with the Indians. As a member of the assembly, Joseph Phipps was one of the signers of Penn’s original Pennsylvania charter drafted in 1683. The obituary for Joseph’s wife Sarah (see below) mentions that the couple “appear” to have first resided in the Chester area before moving to Philadelphia County. A 1683 record refers to Joseph Phipps purchasing 500 acres in Pennsylvania from Benjamin Clark of London. In 1684 he acquired a 25-foot-lot in Philadelphia. This was on the west side of Front Street and was bounded by Second Street on the West. The lot was between Sassafras and Mulberry Streets. Joseph Phipps maintained a tallow chandler shop in Philadelphia in Elfreth’s Alley. Elfreth’s Alley still bears that name and is today a National Historic Site. The alley can be viewed in Google Earth. There it appears as a narrow pedestrian alley between Front and Second Streets, about three blocks south of the Benjamin Franklin Bridge and separated by Interstate 95 from the wharves. Joseph Phipps owned property on the north side of the alley, and evidently lived there. As Sarah (Binfield) Phipps’ obituary mentions, she and her husband Joseph suffered the complete destruction by fire of their home and out buildings during the winter of 1694. Quaker records of the Philadelphia Monthly Meeting dated the 26th of the 2nd month, 1695, mention an ongoing effort to collect subscriptions for the relief of Joseph Phipps. Members were requested to bring their donations to the next meeting. Records indicate that £22, 12 shillings, and 7 pence were collected in the meeting held on the last day of the 3rd month in 1695. Sarah —-, was born at Reading, in Berkshire, England, in the Ninth month, 1643. She was convinced of the Truth in her childhood, and about the time she reached maturity, suffered imprisonment on several occasions for her faithfulness in attending religious meetings. She married Joseph Phipps, who had been a great sufferer in the same place, for his testimony in support of his Christian principles. They came to Pennsylvania, in the year 1682, and appear at first to have located themselves about Chester, Joseph being appointed to represent the county of Chester in the Assembly, which was held at the beginning of 1683. They soon removed into Philadelphia county, in the neighborhood of Abington, he being in 1687 an active member of Dublin Monthly Meeting. In the winter of 1694, they met with a serious loss in the destruction of their house and out-buildings, by fire. The immediate destitution was so complete that the Quarterly Meeting of Philadelphia, which occurred a few weeks afterwards, directed its treasurer to furnish them funds for present need, and recommended the Monthly Meetings to furnish further aid. It appears that no lives were lost, and the pecuniary embarrassment was soon removed through the kindness of their Friends, and the renovating effects of industry. Soon after the year 1700, she appeared in the ministry, in which for the last twenty years and more of her life, she was, her Friends testify, “serviceable” in the church. In 1716 she was left a widow, and survived her valuable husband about eight years. She died on the 27th of the Eleventh month, 1725, aged 81 years and 2 months. More about this couple will probably be added to this article later. READ THE COMMENTS BELOW. In the picture painted by Benjamin West ,do you know if Joseph Phipps is the fellow standing next to William Penn in the green coat and hat or the fellow on the other side between William Penn and the Indian ,he looks like he is some cloth or fabric ? For this Joseph Phipps is my seventh great grand father . I hope you might be able to clear this up for me . this is also one my ancestors. This is interesting. Joseph is my 4th great grandfather and if you have not been to Uwchlan to see the Phipps Cemetery there be sure to go. It is great to hear from direct line Phipps descendant of Joseph. Would you be willing to share your direct family line from Joseph to you? Joseph (1640-1716) is my 9th great-grandfather. I descend from his son Joseph (1671-1762), his grandson Joseph (1700-1772), and his great-grandson Joshua (1745-1835). Feel free to e-mail me direct at ptphipps@att.net if you prefer not to share details on your family line from Joseph to you. Hope to hear back from you. What proof is there for the marriage of Joseph and Sarah in 1665 @ St. Laurence’s Church in Reading, Berkshire? This marriage does not exist in the St Laurence church registers for this time period. You are very correct about the lack of a marriage record for Joseph and Sarah. I too have not seen such a record and on location research by a fellow Phipps descendant recently did not yield any such record of marriage between Joseph and Sarah. There is a marriage record for a Sarah Binfield (a Quaker in Reading, Berkshire County, England) who married Henry Day in 1668. Others have speculated that Joseph’s wife was Sarah Brimfield. The actually marriage record of Joseph and Sarah still allude us. Quaker records reveal a Sarah Phipps going to prison in 1670, while a record from 1671 notes Joseph Phipps and his wife Sarah on a list of Quakers in prison. The oldest Quaker birth record for any children of Joseph reveals a Josiah Phipps “son of Joseph” who was born in 1668, but this Josiah died in 1669. Like you, I am anxious to find either the original marriage record between Joseph and Sarah (hopefully to reveal Sarah’s real maiden surname) or at least the oldest record that states the two of them were married in roughly 1665. How exciting to run across this account by accident! I am also a descendant of this Phipps family, down through the marriage of Eliza, daughter of the younger Jonathan Phipps, into the Seyfert Family in Reading, PA in the 1840s. (not the UK in this case, but an interesting coincidence). I have photos taken in the 1920s of the Phipps homestead in Lionville and Uwchlan Meeting House, both in Chester County. Having grown up in Philadelphia, I had no idea that an ancestor was in that famous painting at William Penn’s right hand side! Have you been to the cemetery in Uwchlan? I found this great story while trying to document my possible connection to Joseph Phipps. If I have my family tree correct, his son is John Phipps 1662-1762. Benjamin had two sons David B. Webster 1821-1906 and Henry B. Webster 1828-1909. And then I have documentation from these two sons down to me. Can anyone help me definitively make the links between the above listed people? I’ve searched Ancestry.com with little luck. If the above info is correct, it would make Joseph Phipps my 8th great grandfather, and me one happy Genealogist. Does anyone have any portraits of any of the early Phipps in America? I am working on my family tree and was wondering if anyone has any. I do not.